Teaching in a boys school, I am always on the lookout for books that will appeal to my students. Kicking Goals is one that meets many of the requirements I have to make me recommend a book to my students as a “should read”. It is an entertaining and inspiring book. What is there not to love about it? Kicking Goals is about two well-known sportsmen who have set high standards, not only concerning their sport but also about how they live their lives. The author, Anita Heiss has the ability to write books with insight and humour that young readers enjoy and can relate to. The fact that they are all indigenious and one dollar of every purchase of this book goes to the GO Foundation, which provides educational scholarships to indigenous children, adds to the worth of the book. There are also Teaching Notes to accompany the book for teachers who may be interested in the book as a class novel. The story would best suit readers in upper primary or lower secondary schools. This book is aimed at younger readers, and I think that the boys I know would particularly like it. The book is about Adam Goodes and Micheal O’ Loughlin, who were amongst the best footballers to ever play for the Sydney Swans AFL club. Anita Heiss interviewed both men separately and their responses to her questions are written alternatively on the pages of this short book. The character of the men comes though their responses as they voice their ideas about growing up, the importance of friendship, goal setting, sport, family, etc. This is a book that many young boys, and especially many young Indigenious readers, boys or girls, would respond to as they set their own goals. Although as an adult I notice and acknowledge many of the former issues, younger readers should simply find it fun to read as well as giving them an insight into the lives of some well-known sportsmen. It is fun to read with a lot of banter and humour as well as the more serious stuff. Responding to the class novel: Wonder by R. J. Palacio. This term our year 7 students are reading Wonder by R. J. Palacio. I have been working on different activities that our teachers could use with their classes. This week I have been working with one of the year 7 classes and they been the first to trial the some of the activities. One of the first activities, for those that had finished reading the book, was to think about the vocabulary used in the novel, creating a list of words that the boys then created their own word searches. 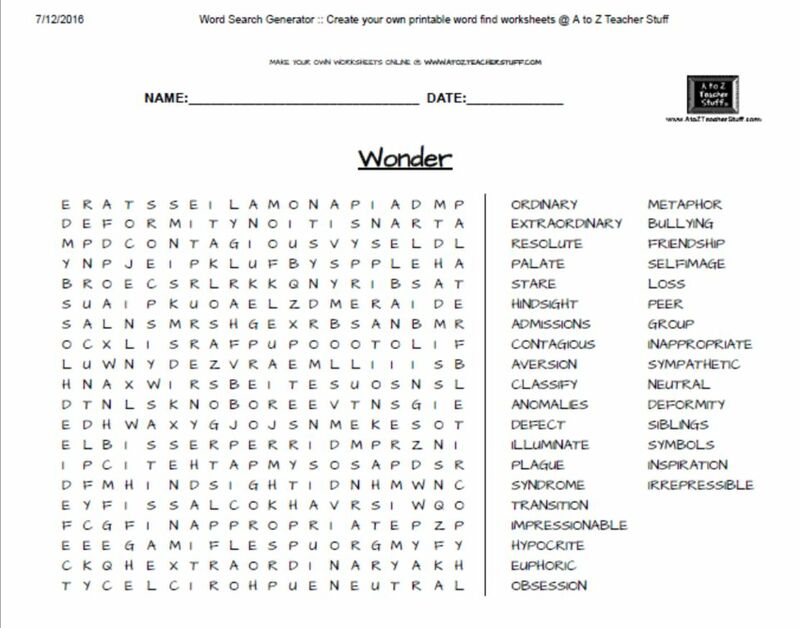 We use Word Search Generator that allows you to create your own printable “word find” worksheets. It is very simple and easy to use. There are several options that allow you to tailor the style of word search very easily. Some boys worked in pairs and others preferred to create one on their own. Some have already been shared with boys from other classes. Both groups have been totally engaged in their work and there has been some great discussion. These same boys have now gone away to create crosswords using Eclipse crosswords. This is a tool I have used many times to generate crosswords as extension activities. Our student book club boys have created some, based on books they have been reading, recently as well. These new crosswords will be shared with the class next week. Eclipse offers another very simple tool that allows boys to explore the language used in the novel. We are always looking for books to engage our boys. The Premiers’ Reading Challenge is being promoted to classes this week,. It has been a good time for revisiting some of the literature we have added to our collection and promote books that appeal to our boys. Robert Newton‘s books Runner and The Black Dog Gang are two great Australian stories. This is a fast paced and gritty historical novel set in Sydney in 1900. It is also a story about friendship, loyalty and the bonds that can form in harsh conditions. The world the boys in the book inhabit is full of poverty, dirt and hard-work. Frankie Maguire relates the story of his gang. There are 5 boys from shabby inner city Sydney who form a friendship and bond together. They experience bullying and violence and name their gang after a pirate from the “Treasure Island” story. At this time Sydney is panicked by an outbreak of Bubonic Plague and there is a bounty of 6 pence on rats. The boys set about making money by finding and catching rats. They come up with an interesting money-making scheme along the way. The era has been well-researched and the characters are believable and likeable. There are wonderful descriptions of school and family life and a rather gross description of the rats eating cats (our boys rather like that). The dialogue is also rich with colloquial language and terms of the time. This is an interesting story about a time in Australian history that most us know little about today. Our book/reading group has been reading and reviewing quite a few books this term. This is one of mine. This is the eighth book in the Young Sherlock Holmes series. As with the other stories in this series the period detail is well-researched and convincing, the characters are engaging and the plotting is excellent. In this story the Holmes brothers, Sherlock and Mycroft, are called back to their family home for the funeral of their mother. They begin to prepare for her funeral and sort through what needs to be done as well as trying to decide how best to support their sister, Emma. They are all dealing with a sense of loss so when Emma claims that faceless men are visiting the house Sherlock doesn’t believe her. However Sherlock investigates and discovers that three men in bizarre disguises have broken into the house in the middle of the night. When Sherlock finds them he is viciously attacked. The family seems to be caught up in some strange mystery that they have no understanding or knowledge of. The next occurrence involves men, posing as builders, attacking their sister’s fiancé. Both Mycroft and Sherlock independently deduce that the mystery is somehow connected to the building of the Suez Canal. The paths they then follow turn out to be very different, as Sherlock, with his ever loyal friend Matty, setting out for Egypt, determined to discover just what is going on. He feels betrayed by his brother and follows his own instincts to get to the bottom of what is going on. The nature of loyalties and friendship is called into question before the book is finished.